In the midst of the seemingly unceasing cold and storms that have battered the East Coast, The Side Door Jazz Club in Old Lyme has been a beacon of live music. Musicians love its piano and intimate performance space while patrons enjoy being part of the "action." Plus, it's connected to the Old Lyme Inn and there are "weekend packages" where one can stay over, enjoying the food, the ambiance of a small but arts-centric community of Old Lyme, and the allure of the beaches. All this in less than 2 years. This coming weekend (February 27 & 28), Ken and Jan (who manage/book the club) present 2 great shows. Friday night at 8:30, drummer/composer E.J. Strickland (pictured left) celebrates the release of his new CD, "The Undying Spirit" (Strick Muzik). Despite appearing on over 30 recordings in his career (now into its second decade), this recording is only his second as a leader (his debut "In This Day" came out in 2009). 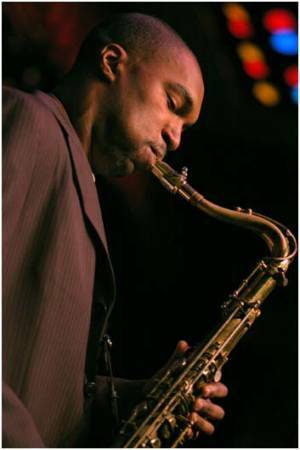 He's bringing the musicians who appear on the recording; they include Jaleel Shaw (alto saxophone), Luis Perdomo (piano), Linda Oh (bass) and twin brother Marcus (tenor and soprano saxophones). While E. J. could have easily made this a recording about his brilliant technical prowess, instead this is most definitely a group recording. Ms. Oh's active bass lines, Perdomo's probing piano work, the singing reed lines of Shaw, the uplifting sound of brother Marcus's hardy tenor and the lilt of his soprano work, all this and more makes this album a success. When you see E. J. live in concert, watch and listen to how he directs the music from his chair. The essence of the uptempo pieces is how the music moves and flows; that gives the music its excitement. A review of the new CD will posted here soon but, in the meantime, to find out more, go to www.ejstrickland.com. On Saturday, bassist/composer Ben Wolfe comes to The Side Door and, like E.J. Strickland, he's celebrating the release of a new CD. "The Whisperer" (Posi-Tone Records - here's the review). He, too, is bringing the musicians on the album, pianist Orrin Evans, drummer Donald Edwards and saxophonist Stacy Dillard. Wolfe, who has worked with so many contemporary musicians (Wynton Marsalis and Diana Krall, to name but 2), creates music that concentrates on melody and, certainly, rhythm but, unlike many leaders who come from the rhythm section, he does not take many solos (so, I suppose, it's not "all about the bass"). This particular quartet is quite strong, the revelation being the excellent saxophone playing of Stacy Dillard (pictured left). The Michigan native has worked with numerous contemporary musicians (including being a member of Orrin Evans' Captain Black Big Band) and has released several fine CDs as a leader including 2011's Criss Cross release "Good and Bad Memories." His work with Wolfe, especially on the numerous ballads, is heartfelt, emotionally strong and oh-so-melodic. He also let loose with a flurry of notes when called for. Dillard is really finding his voice on his reeds and it's refreshing to find a musician who does not overtly sound like John Coltrane or Wayne Shorter or Sonny Rollins. Check him out at www.stacydillard.net. To find out more about Ben Wolfe and his music, go to www.benwolfe.com. To obtain tickets to these excellent shows, go to thesidedoorjazz.com. You can also call at 860-434-0886.